What's a Paid (Not Free) Album Coupon? Some people are not satisfied to just collect the cards and albums. Some people just have to have more. What else is there to collect? Completion cards for one, Order Forms for another and Free Album Coupons to boot. Oh yeah, not every album coupon is free. The ones on this page will cost ya. The Brooke Bond era showed us albums at a quarter a piece whilst the Lipton age brought us up to a buck. They were issued during the entire run offering as many albums as you want for .25¢/$1 each. The cool part was that with some of the forms, they took the coupon and used it as an address label on the envelope back to you. I also include here some completion coupons as there is a bit of overlap between all of them. Are there different kinds of Paid Album Coupons (PACs)? Version "C" Version "D" Version "E" Version "G" Version "J"
What Series ran Which Coupons? Say that again? What I am trying to say is, for version "G", what series had that type issued? Some of this is a guess for me because this list only represents the ones I have seen with my own eyes. If you have an image that you would like to send me to prove that something exists that is not on my list, I will give you credit. "C" - The "C" coupon is really more of a completion card. 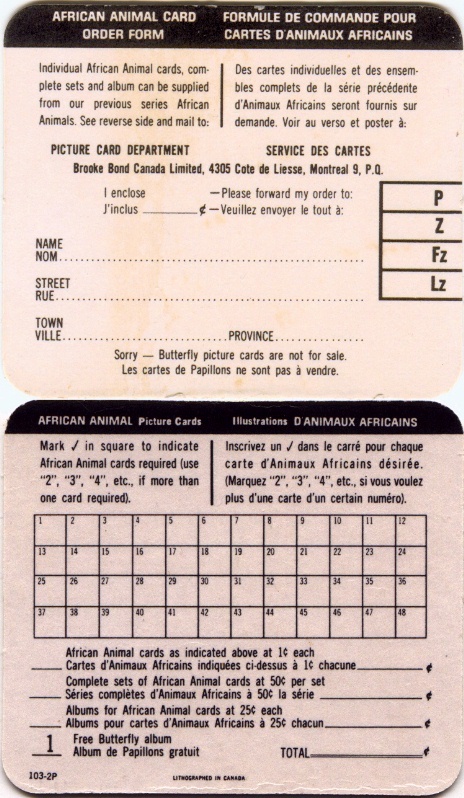 Completion cards are described in another section. The thing is, starting with series 7, the coupon could be used to order a free album and pay for others if you want. That is why I list it here. 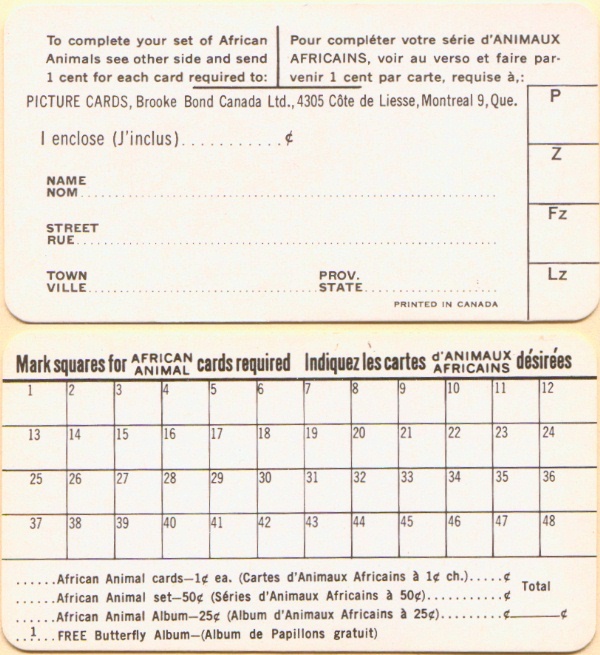 You can see the free album offer for series 8 at the bottom of the image but above it you can order all the African Animals albums you want for a quarter each. 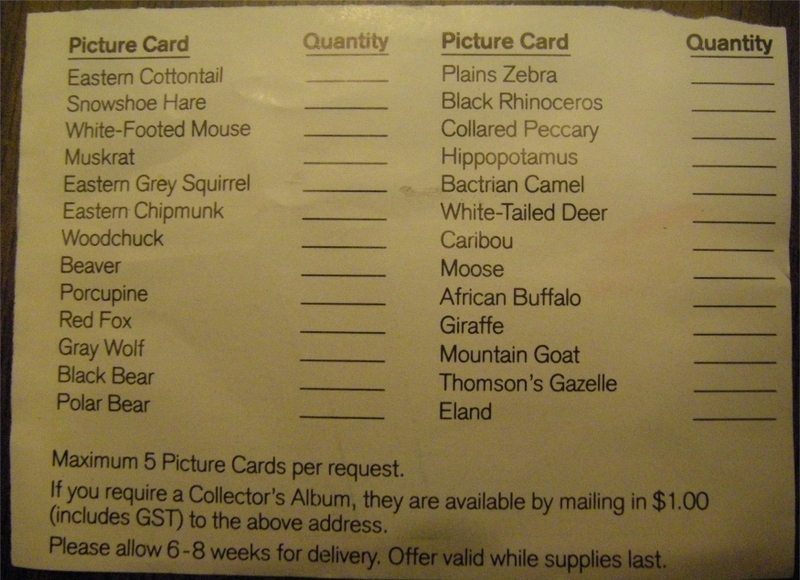 The completion cards from series 1 to 6 offer albums for the next series but at the usual cost of .25¢. Series 15 does not even offer an album for series 16 at all. "D" - Similar to "C", I would classify "D" as more of a completion card but it always offers a new free album and the current album at a quarter a piece. That's why it appears here. 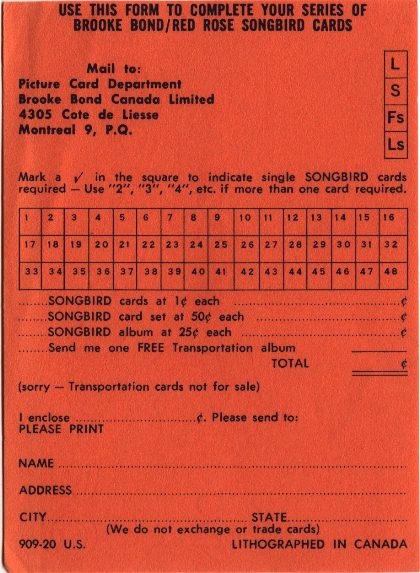 Completion cards typically offer a chance to pick up ending series loose cards and a beginning series album. In this case some series 9 cards at 1¢ each but also offers a new series 10 album free. Also note that you can get the ending series 9 album, but that still costs .25¢. This type of coupon is referred to as monopoly money. "E" - The "E" coupon is also a completion card. It is printed on thick cardboard and is almost square. What it offers is very similar to the type "D". "G" - The "G" coupon comes from a newspaper magazine. Along with the coupon was a nice graphic of the album, several points as to why you should get it, and a picture of the product line. "J" - The "J" coupon is believed to come from a magazine based on it's light weight but that is just a guess. Buy as many albums for a buck that you want. Thanks to Dave Huebert for sharing the discovery. Remember, I said this list represents what I have seen. If you have something different, scan it and send it to me. I also said that this is a Paid Album Coupon list, not an exhaustive list of the different types listed.